Join the discussion on our forums! Come discuss Lesser Jasper Spellstone over in our dedicated Lesser Jasper Spellstone discussion topic. In ancient woods, elves fought the curse The demon’s shadow to disperse But hatred raged and frail souls turned Now horned and hooved their forests burned. Hell, When I get my Malfurion the Pestilent this card upgrades in three turns. and ONE mana for 6 damage? hey thats a good deal! You can upgrade it in 1 as the intial cast of Malfurion the Pestilent is counted as a gain 5 armor and then hero power to gain 3 more so you can upgrade it to max in one turn. This card is broken. If you look at the other updated card, the first option is overcost. This card have a fair first level, and crazy third level. It should cost 2 mana, as 2 mana deal 4 is already good, and 2 mana deal 6 is very good, 2 mana deal 2 is a bit overcost. I think I speak for everyone when I say this card will leave us a bit... jaded in the coming months, especially with how it combines naturally with the Death Knight. This may even lead to a reintroduction of cards like Gnash and Claw to the meta, though that may be a pretty outlandish guess. Still, who in their non-feral minds would turn down a 1-mana Shadow Bolt or Fireball? Dealing damage for such a low cost is always useful for removal. My only question is does the 3 mana need to be built up all at once or over time, because if it's all at once Gnash might be making a resurgence in Druid decks. this gives druid the best single target removal in the game, filling their last weakness. Assuming there are easy ways to get armor this could be a great card. Oh, and yes, there are tons of cards that give druid armor. So yeah, this is good. Hey jade, we nerfed some of the cards we gave you, never mind that they're still stupidly broken, here, a 1 mana 6 damage removal for late game use after your ''Earthen Scales'' or ''Feral Rage'', hope that makes up for it. Its confirmed that u need 3 exact Armor to upgrade this thing ._. No, you're wrong. If you use your basic hero power three times while this is in your hand it will upgrade. You can't upgrade it twice with something like UI but if you gain 3 armour twice separately in the same turn it will upgrade twice. 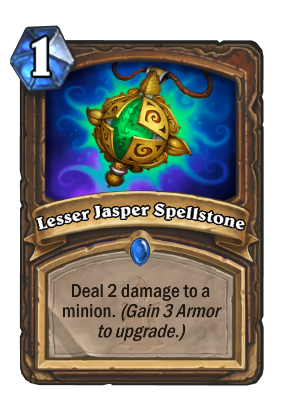 I'm surprised they didn't make this card have synergy and upgrade each time when you summon a jade golem. Druid will never be a control class and any card that doesn't directly support the jade druid archetype is just pack filler garbage. So by your logic that makes this card unplayable in standard after the rotation next year? Brilliant. I, too, speak sarcasm and laughed out loud - good job, sir!